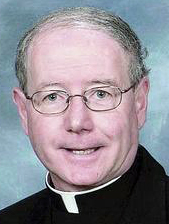 Father John A. Freeman, 65, a former pastor of St. John Fisher Parish in Boothwyn and former Newman Center chaplain, died Sept. 21. Born in Philadelphia, the only child of the late John Patrick and Mary Catherine (Mulvaney) Freeman, he attended St. Alice School, Upper Darby, and Msgr. Bonner High School before entering St. Charles Borromeo Seminary at age 17. He was ordained May 19, 1973 by Cardinal John Krol at the Cathedral of SS. Peter and Paul. Father Freeman served as parochial vicar at Our Lady of Lourdes Parish, St. John the Baptist Parish and St. Timothy Parish, all in Philadelphia, and St. Andrew Parish, Newtown. He also served on the faculty of Bishop Shanahan High School and was Newman chaplain for Bryn Mawr, Haverford and Swarthmore Colleges. He also taught on the adjunct faculty of St. Charles Borromeo Seminary. He was appointed pastor of St. John Fisher Parish in 2004 and retired for reasons of health in 2011. In his personal life, Father Freeman loved eating out and traveling, Robinson recalls, and although he was fighting cancer for the last six years of his life, “he tried to do a little bit of everything until he had to retire,” she said. Father Freeman’s funeral Mass will be celebrated at St. John Fisher Church by Archbishop Charles J. Chaput on Friday, Sept. 27, at 10 a.m. Concelebrants will include Msgr. Deliman, Fathers John J. Dinda, James E. McVeigh, James C. Sherlock and Father Edward P. Burke, who will be the homilist. Father Freeman had no immediate survivors. Burial will be at Calvary Cemetery, West Conshohocken. I was saddened by the death of my high school classmate and friend, Fr. John Freeman. John was a truly nice person and was the same whenever his path crossed yours and for us that went back to 1961. He could laugh with the best of them. He was devoted to his parents and always wanted to be connected with the Archdiocese, even when many of his friends from Bonner were entering the Augustinians. It was great that both his parents were alive when he was ordained. He loved working with young people but enjoyed the parish work as well. May he rest in peace.